I am a Danish Ceramist – living and working on the North West coast of Scotland for the past 50 years – IK work with a close, continuing and intense relationship with the landscape – an endless source of inspiration for my work. ​I have been playing with clay since I was 8 years old – left school at 14 and became an apprentice with Gutte Eriksen a Danish studio potter – later worked at an 8 generations traditional slipware pottery where I was taught by Knud Jensen in Denmark – I travel extendedly, working in Pottery’s in Ireland, Scotland and France – I have been exploring the landscape in Iceland, The Faeroe islands, Greenland, New Zealand, Australia, Spain, Sweden and La Gomera also visited New York, Barcelona, Stockholm, Helsinki and other cityscapes. I have regular exhibitions of my work, which is also represented, in public and private collections worldwide. I am now deeply involved at my 14 acres sculpture croft at the shores of Loch Eriboll – here my new studio and house was relocated in 2004 – if not working in my studio – I will be out sculpture crofting. My Loch Eriboll croft is not a sculpture garden, park or a trail – it is 14 acres of rough croft land with uneven tracks finding their way in and out of trees and bushes, and across bog and heather. It is a place for discovering and contemplating and enjoying a point in the universe. Maybe you will meet some of my ceramics under a tree or behind a rock or discover one lying in the heather looking up at the sky. It is more of a ‘sculptured’ croft – an evolving place where small tracks created by sheep and deer over many years were its starting point. When I arrived in the summer of ’99 it had been lying dormant for 36 years – and for me it was like fourteen acres of blank canvas. 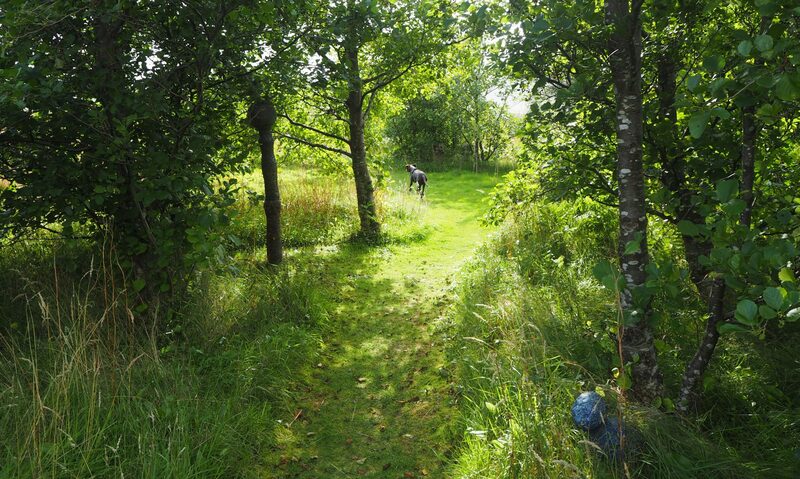 First I fenced the croft to keep the sheep and deer out – I bought a strimmer as my new pencil – and followed the sheep track, gradually extending round and round the croft so that now one can walk for miles… and get nowhere! I have now planted over 4000 trees – mostly native with some immigrants – and lots of fruit trees and fruit bushes are scattered around. I am an optimist and I will try to grow anything on this desolate spot on the north coast of Scotland – abundant with rocks, almost no soil, plenty of heather and gales. Now 12 years later the canvas is taking shape; most trees are growing and some are even taller than me. I can even play hide and seek with my grandchildren or just sit between the trees in a sheltered spot and enjoy the peace, the sounds and the scent of the trees. I have ample fruit and berries and my ceramic sculptures are sprouting up around the croft, between the trees, behind rocks and, little by little, emerging through the long grass, heather and flowers – running across the hill, hiding behind rocks or bowing to the sky sending beams of light out into the universe or mirroring the landscape – a sitting stone here or there for resting on – creatures guarding the apple trees or the Loch Eriboll Choir just singing for joy. On sunny days my bees are enjoying the new growth of the croft and small secluded spaces, dedicated to my grandchildren, within the croft, between the trees, are in progress. The canvas is slowly taking shape – carrying on with the croft, sculptures, trees, flowers, ponds and endless visions and dreams – it will keep growing on till I am no longer here. I am ruled by the weather; as soon as it is a good day I leave the studio for the croft, tending my fruit trees, sculptures and crop circles. My house is floating through the air, keeping an eye on Ben Hope or any stranger sailing into Loch Eriboll from the North. My wonderful light studio (also designed by Gokay Deveci) keeps me busy when not out working on the croft. Yes, I am happy here taking root together with the trees and sculptures. In the future I hope others will walk and enjoy this tiny little annex of the universe. There is no map of the croft – no directions – maybe just a little surprise here and there – a place to lie down and contemplate the clouds and the endless universe – unless the gales are thrashing the landscape and all you can find is a bit of shelter watching the power of nature. Only when the dreaded midges are patrolling the croft will you want to leave in a hurry. Good walking shoes/wellies or boots are needed – maybe even a walking stick to be on the safe side. Your dog, children and picnic are welcome too.